Forester fans have been waiting for the all-new 2019 Subaru Forester SUV to arrive and Subaru of New England is one of the first dealers to get one. They received one of the first fifth-generation Foresters shipped from the factory in Japan. 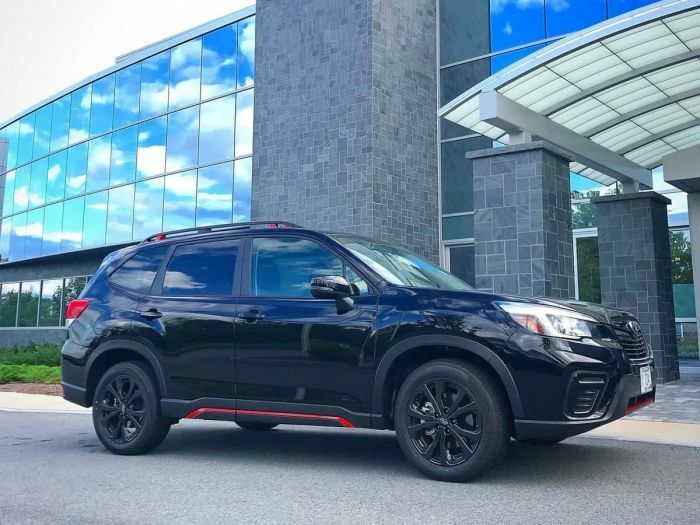 Even though the first redesigned models are starting to arrive, the 2019 Forester won’t be available for customers until October across the U.S.
Subaru of New England, owned by Ernie Boch Jr., CEO of Boch Enterprises, is an independent distributor for 64 Subaru dealerships in the six New England states, Connecticut, Maine, Massachusetts, New Hampshire, Rhode Island and Vermont. His dealerships will likely sell more new Foresters than the countries of Canada and Australia. Last year, Boch Enterprises sold close to 65,000 vehicles of the brand's U.S. total of 647,956. In other Forester news, Subaru Corp announced the new 2019 models will ride on Falken tires. The small SUV will come fitted with Falken ZIEX ZE001 P225/55R18 - 98H, manufactured at Sumitomo Rubber Industries Ltd.'s (SRI) plant in Rayong, Thailand. They will be shipped to Subaru's factory in Gunma, Japan where the Forester is built. This is the third Falken OE fitment with Subaru in the past 11 months. The new 2019 Subaru Ascent 3-Row SUV and the 2018 Crosstrek crossover also ride on Falken tires. The ZIEX ZE001 features four circumferential grooves that Falken said evacuate water and enhance hydroplane resistance and stability in wet conditions. The Falken tires are also OE equipment on the Nissan Rogue SUV. In a curve, you know where you want to go, but wet road conditions could cause the wheels to move laterally, sending the car into the ditch. If this happens, VDC will reduce engine power and/or apply the brakes to slow down individual wheels, pulling Forester back into your intended path through the curve. New for 2019, the Sport, Limited and Touring models come standard with a dual-mode version of X-Mode that offers Snow/Dirt and Deep Snow/Mud modes for even more all-weather capability. The all-new 2019 Subaru Forester will be available in October across the U.S. and Canada. Without turbo on a Forester, how can we beat Toyota fav 4 design? Did u see the new concepts from Toyota? It put Forrester design back many yrs again. We need the turbo not to go fast, but for towing in the mountains. It depends on your need, the NA 2.5 with MT has pretty good solid road handling but is quite lethargic when you need that extra power for passing on the Highway (with 4 passengers and two hockey Bags in the trunk). On the other hand it is cheaper to buy and cheaper to run. My ideal Forester would have that 3.6L engine of the Outback with MT instead of CVT. We are finally able to buy a new car and really wanted a new 2019 Forester with the reduced noise and better ride and better interior like the Outback. But learning it comes with a wimpy 2.5 engine was really puzzling. The 2019 Outbacks have the 3.6 but for some reason they think the more rugged version doesn't need the extra power??? We plan to take road trips and being able to pass and accelerate or getting on the freeway with short on ramp it is IMPORTANT to have a car that can bring it when you need it. My daughter owns a 3.6 Outback 2018. Also an Impreza about 2015. We may just have to go with the Outback which is not as roomy with less visibility and this is disappointing to say the least. I was a big fan of Subaru but it is the least evil being sold out there which is not saying much. We wanted AWD due to lots of rain and icy conditions. I also wished it was electric so I am not tied to one fuel source. I live in hyro electric area. I wish Elon would make a cool SUV that was competitively priced. The consumer reports their their cars are excellent but over priced and too small and not able to meet the demand. I feel a bit led around by the nose by these car manufacturers. I thought when we bailed their you know whats out after 2008 they would do better. They are just giving a lot of lip service. They could work together to create a grid of fueling places for electric cars but just don't. I thought by the time I was able to pay for a new car the options would be spectacular but they miss the mark in a big ways. The electronics on these things are wonderful but Subaru has a terrible track record with just the simple radios with these units. How hard can it be to make a radio? The Impreza had a horrible phone interface which you could hardly understand the person on a call. No fixes for it either. Her Outback's radio had to be replaced since there was no fix for it so they gave her a newer model?? I read up about the head gaskets on Subarus and for years Subaru couldn't engineer themselves out of a paper bag let alone fix simple things like the gaskets or simple radio. We can't afford to be living with a bad new car so trying to it vet this purchase out but the more I look the more problems I see, not really solid options. Maybe buying used like we have been and not paying top dollar for old technology and poor engineering with these new models might be a better way to go and to adjust expectations all around. Sitting on the fence. Trillium, test drive one and let me know. As for me, I'm not on the fence and will keep my 2017 XT. The 2019 Forester is larger and heavier - I don't see how a 2.5 CVT engine will work, regardless of the small bump in HP from the previous generation.